Companies have always needed HR professionals to help their organisations operate smoothly and find the best talent for their vacancies. While some businesses entrust these duties to an in-house human resources team, others are increasingly turning to freelance HR specialists and the opportunities they can provide. Not only do companies benefit from the flexibility and specialist knowledge contractors can bring, but being a self-employed HR manager has benefits for individuals too – variety of work and more control of working hours, to name but a few. HR manager was ranked sixth in Glassdoor’s 25 Best Jobs in the UK list for 2018, while HR business partner was ranked 13th. We’ll provide key information about the role of HR in organisations in general, as well as the skills and qualifications you’ll need to work in the sector. We’ll look specifically at working as a HR manager on a contract basis too. 1. What does human resources do? 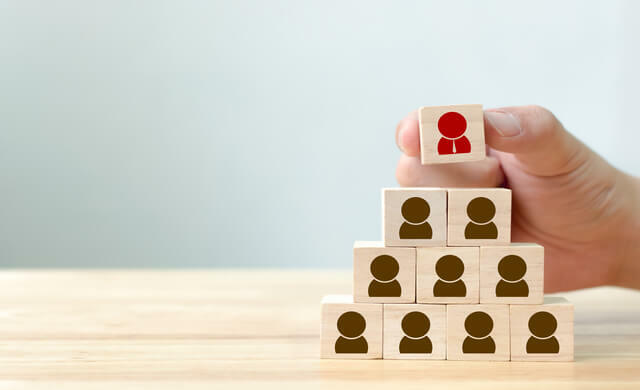 As the title suggests, the role of HR is focused on people – managing the needs of a company’s current workforce, as well as finding new talent to fill vacancies. It’s responsible for promoting and managing the organisational culture, as well as ensuring best practices and laws are followed, such as reporting health and safety incidents. How the HR department is organised varies from business to business, as this often depends on a company’s size, budget and focus. For example, in small businesses, there may be only one or two team members who focus on HR in general, covering everything from maintaining employee records to hiring staff. In comparison, a big company with a dedicated HR department may have individuals – or even whole teams – that specialise in a particular area of human resources, such as payroll or development. What do human resources do? In this section, we’ll outline some of the most common ways of getting into human resources, with a focus on ultimately becoming an HR specialist. Training from a professional body – specialist Chartered Institute of Personnel and Development (CIPD) training offers qualifications suitable for entry level through to senior roles, including an HR manager. If you’re looking to run your own business by working as an HR manager on a contract basis, you’ll need to have advanced level qualifications and more extensive work experience. You could achieve this by getting a lower level HR role and studying alongside of work to progress up the department’s structure. You could also consider a Master’s degree, or CIPD training. High level qualifications are particularly suitable for those wanting to offer HR consultancy services to companies – or work on a contract basis – as they equip you with strategic knowledge. You can learn more about this type of training by reading our what is a CIPD qualification article. At this point, you’ve learned more about what HR does and the different ways in to working in the profession. In this section, we’ll focus on how to specialise and work as a HR manager on a contract basis. Be sure to write a business plan – you can find a template here. Training – whether you’re looking to complete a degree, CIPD training or other qualification, you’ll should consider course costs when compiling your business budget. Equipment – you’ll need a computer and a mobile phone, as well as any specific HR software you might require to carry out your contracts. Premises – you may decide to work from home or from a coworking space. Wherever you decide to work from, you’ll need to factor in the costs to get set up. This may be decorating your spare room and filling it with a workstation, or it may be the initial payments to secure a desk or office space. Insurance – you’ll need to protect your business, including its contents and buildings, as well as assurance for the advice you give or cover if you are unable to work. Remember you’ll need to register as self-employed with HM Revenue and Customs (HMRC) – read our article for a step-by-step guide. HR managers in the UK tend to earn between £20,000-£50,000 approximately. This varies depending on how many years’ experience and the level of qualifications you have, as well as differences between regions and sectors. However, as a self-employed HR manager, your earnings are likely to vary, as they depend on how many contracts you can take on. As well as this, when setting your rates, you’ll have to bear in mind that you won’t receive pay when you’re sick or on holiday. You should also budget for any periods of time in between contracts. Create a website – having an online presence is essential. You could use a website builder to quickly and easily design your own site with key information about your business, such as contact details and available services, as well as previous experience. Be on social media – create a profile on LinkedIn to connect with other individuals and companies in your sector – especially those who operate within your specialism, whether that’s recruitment, employee relations, or something else. Use Twitter to share useful information with your network, such as articles on changes to employment law. Hand out paper marketing materials – offline marketing can also be useful to promote your business. Print business cards and leaflets and hand them out if you meet potential clients. Attend industry events – conferences, seminars and networking sessions all offer opportunities to connect with key figures and potential decision-makers. Plus, they enable you to stay up-to-date with the latest news and trends in HR. Use word-of-mouth – once you’ve worked with a few clients, you could ask for testimonials to include on your website or social media profiles. Similarly, you could ask for referrals from previous clients who may know of other companies that are also looking to hire a freelance HR specialist. “Starting up on your own can be a challenge but it can be incredibly rewarding working to your own values and seeing a positive impact on your clients. “Here are a few insights on my first few years in business and what has helped me. “Becoming a freelance HR consultant is all about building strong relationships of trust with your clients. The following are some of the things I have learned along the way. “A few tips that are common to all small businesses but worth mentioning! “If you have set up as a business, make your branding clear and treat every interaction with clients professionally. “Make sure you have email footers, with links to your website and social media and that you are consistent across all your channels. “Have a professionally taken photo front and centre on your website and social media; HR is a people business after all and your clients will want to see you and get to know you. “A good website that highlights how your skills and experience can help clients is essential. Make sure contact emails and telephone numbers are correct and kept up to date. Include testimonials from happy clients. “Many small business owners understand HR from a compliance and risk avoidance perspective, but they may not know how HR can positively impact the culture of the business and the bottom line. “Find ways to educate them on why best practice matters and how many of the ‘softer’ HR skills can lead to better employee engagement productivity. “Don’t use HR jargon when speaking to clients; what makes sense to other HR professionals can sound like a different language to clients and you can lose their interest quickly. “Learn about the business of potential clients. What HR challenges might they be having? There will be common themes, but certain types of businesses will struggle more to recruit, flat structures may struggle to develop employees and retain, most will have internal communications issues. “You don’t want clients to be better versed to changes in statutory regulations or recent case law than you are! “Keep up to date on HR news and attend CPD events in your area. It’s a great way to connect with other HR professionals to discuss best practice and can help break any feelings of isolation you may have when starting up. “Social media is a particularly good way to reach new and existing clients with short, regular and useful updates and it lends itself well to HR with its constantly changing landscape. “Follow clients who reflect your values as an HR practitioner – retweet, like and comment on their posts. LinkedIn, Twitter and even Facebook are all great ways to reach new and existing clients. “Blog, speak at local events, run workshops and network. Your next client is out there just waiting to learn more about how you can help them. “There are local networking groups in just about every town in the UK; if you can’t find one local to you, start one yourself as a way of gaining local business contacts. “If you are helping a client with employee relations advice, look at their policy documentation – does it need updating? Could the organisation benefit from training in a particular area? “What might need changing in the culture and how could you help them achieve that? Think of all the ways your client can benefit from your experience and let them know. From reading this article, you’ve developed your understanding of the role of HR, plus the training and skills you need to work in the sector, as well as how to become a HR manager. We’ve provided you with the key information you need to know to start your own business as a HR specialist. So where do you go from here? Next, read our page on what is a CIPD qualification to gain a more detailed understanding of this essential training.